Johnson’s Bakery at 128 S. Jefferson St. in downtown Perry, FL needs to be on everyone’s “Bucket List”! Yes, many of our larger communities have Publix Supermarkets with excellent bakeries (Gainesville has at least 10!) 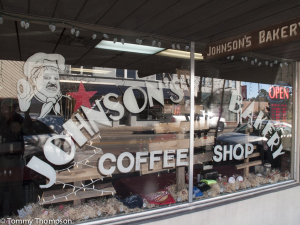 but I’ve never heard anyone claim that they’re better than Johnson’s Bakery in downtown Perry, Florida. Downtown Perry, the county seat of Taylor County, is undergoing a growth spurt and remodeling, and the heart of the action and gathering spot is Johnson’s. Expect a line to the counter at Johnson’s Bakery almost every morning. They open early and close at 4pm (1 on Saturday). And, of course, they’re closed on Sundays. While Johnson’s is known for glazed donuts that put all the national chains to shame, their cream-filled chocolate “long johns” are divine. There are also cream and jelly-filled yummies as well as cupcakes and cookies. Not only is the glaze generously applied, but the pastry is tender–even a couple of days after purchase. Just a quick “nuke” in the microwave will bring them back to all their glory! 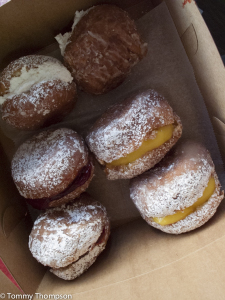 Cream, raspberry and lemon filled donuts from Johnson’s beat all the competiton. Perry, Florida’s Forest Capital, is located at the intersection of US19 and US98. So….if you’re heading north or south on US19 or west on US98, don’t miss this place for some of the best donuts and pastry in Natural North Florida. 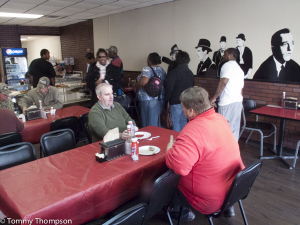 Johnson’s also has a lunch menu–but that’s another subject for another time!